February, 24th. Renaissance Moscow Hotel. 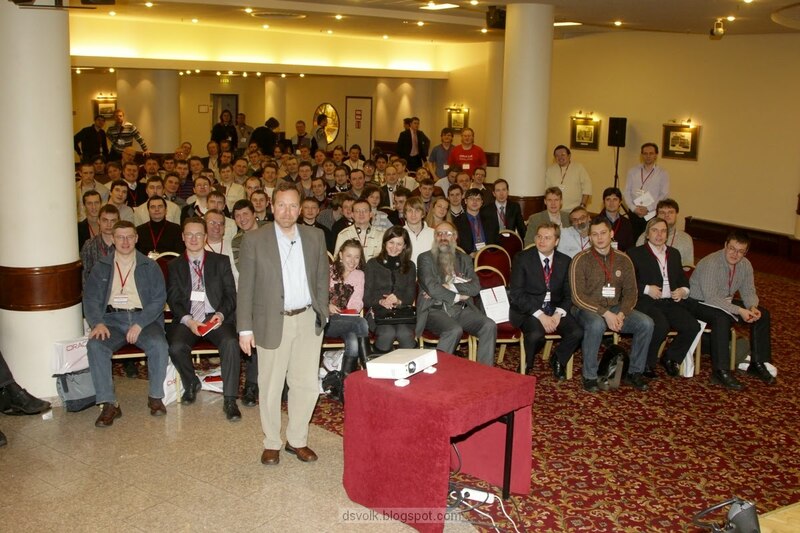 Over 300 of people in hall and Tom Kyte on stage – that is “AskTom in Moscow” for the first time. I heard that Tom is a great speaker. I can confirm – he is. I’d say live Tom’s presentations are fascinating: nice voice, appropriate talking speed, simple examples and very accurate language (just like in a book!). I was amazed by his language – I didn’t know that a man can speak all that things such smoothly, using only meaningful words, and make the points so clear. Tom did five presentations: “How do you know…”, “The Best Way”, “Worst Practices”, “Top 10, No 11 new features of Oracle Database 11g Release 2” and “Why Why is probably the right answer”. All are already available for download. I don’t want to retell them, but I do want to write down couple of quotes (in my interpretation) alongside with my notes. Things Change (slides 22-26 of ThingsYouKnow_OOW.ppt). There were several examples how things changed between releases thus making old suggestions no longer valid. What is better – “IN or EXISTS”. Tom said “In modern releases, you should probably use whatever you like since CBO costs all possibilities and uses the best one”. It’s not always true since CBO can’t cost all variants of query transformation and can limit the search scope. Array Fetching. In Oracle 10g PL/SQL engine has been improved to automatically use bulk fetch of size 100 in FOR cursor loops. When I heard that a recent thread on the SQL.ru came to my mind with a case showing that such optimization could be silently turned off due to DEBUG compilation mode – and this seems to be not documented behavior. The following code throws exceptions with different codes. Why not ORA-00060 always? All in all I enjoyed that delightful day with Tom Kyte. Thanks to all who organized this event and special thanks to Tom for coming to Moscow. Alternative download link for audio recordings. This entry was written by Timur Akhmadeev, posted on February 28, 2010 at 22:25, filed under Oracle and tagged presentations, Tom Kyte. Bookmark the permalink. Follow any comments here with the RSS feed for this post. Post a comment or leave a trackback: Trackback URL.